Hair Replacement Systems Phoenix AZ | Stylistic Inc. Your hair helps indicate your personality, from framing your bold, outer beauty to giving you a platform for expressing your gorgeous, inner beauty. However, many experience hair loss, which can turn into a long battle. A common hair loss condition, alopecia areata is an autoimmune disorder occurring when white blood cells attack the cells in hair follicles. This attack shrinks the hair follicles and slows down hair production, resulting in patchy or complete hair loss. Affecting around 6.8 million people in the U.S. alone, alopecia can occur with anyone regardless of age or gender, developing suddenly, disappearing and reappearing at random. 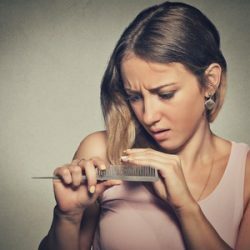 Aside from hair loss, symptoms of alopecia areata also include changes to nails, such as pinpoint dents, white spots and lines, thin or split nails, and dull or rough nails. Alopecia areata shows up as three common types, usually beginning with alopecia areata (patchy) and sometimes advancing to alopecia totalis or alopecia universalis. Alopecia areata typically begins with one or more round or oval coin-sized patches on the scalp or other places on the body such as beards, eyebrows, eyelashes, arms, legs, hands, or feet. This condition typically remains patchy and is the most common type of alopecia areata. Though there is no cure for alopecia areata, people with only a few patches of hair loss can often experience spontaneous recovery without treatment. The patchy variation of alopecia areata may convert into alopecia totalis, the term used when the scalp suffers complete hair loss. Alopecia totalis is a less common variation of the condition that appears to be decreasing with each passing decade. Complete hair loss occurs within 6 months after the onset of alopecia areata in an estimated 30 percent of patients. Even more advanced than alopecia totalis, alopecia universalis results in hair loss across the entire scalp and face, plus the rest of the body. This condition means complete hair loss and is a rare form of alopecia affecting less than 1 percent of patients. Don’t let alopecia areata take away your sense of self-worth and beauty. Stylistics, Inc. offers hair extensions, hair replacement systems, and required services needed to restore your beloved locks. With unlimited options and styles, we work to find the best and most fitting hair loss solution for you. Give us a call at 602-234-3381 today to schedule an appointment!